Melbourne, Australia was both host and witness to an extraordinary event from Dec 3 to Dec 9, 2009 - the Parliament of the World's Religions ("PoWR"), which brought together 6000 delegates from 80 different countries, representing 220 religions, faiths, sects and sub-sects. Although the highlight for many was the inclusion of various indigenous groups from around the world, and the special achievements of the whole event were the rich and varied discussions around the religions and faiths of the world, the Dalai Lama, expectedly, stole the show at the closing ceremony. Despite stiff ‘competition' for time from larger delegations, Sikhs had an emphatic and very visible presence, participating in inter-religious debates, intra religious panel discussions, musical expositions and, of course, the amazing exhibition on Sikhism. According to Dr Tarunjit Singh Butalia, one of the three Sikh trustees on the Board of the Council for a Parliament of the World's Religions based in Chicago, more than 200 Sikh delegates took centrestage in Melbourne. Mejinderpal Kaur (United Sikhs, U.K.) questioned the inertia in the Sikh community and asked why it took Sri Sri Ravishankar of the Art of Living Foundation to negotiate with the Iraqi government to negotiate the rebuilding of gurudwaras destroyed in Baghdad. "Traditionally, Sikhs have always taken up other people's issues, but have we become so idealistically poor that others have to take up our cause?" Bhai Mohinder Singh (Guru Nanak Nishkam Sevak Jatha, U.K.) spoke eloquently at many fora, including one on "what will make a world of a difference". Not only did he provide an answer based on gurbani and Sikh tenets, well produced booklets describing these values were distributed to everyone present. When former U.S. President Jimmy Carter addressed the PoWR about womens' issues, only three female panellists were invited to respond - one being Gurbux Kaur Kahlon, who provided an insightful Sikh perspective. There was full and frank debate at many Sikh intra-religious sessions, some of them being "Sikh Diaspora and Global Sikh Community", "Cohesion and Unity in the Sikh Community", "Interfaith understanding in Sikh Theology and History" and "Sikh Youth Perspectives". An important contribution of the Sikh community to the Melbourne PoWR was the suggestion that a world body be created to preserve historical sites and heritage of all religious groups, inspired by the memory of the destruction of the Bamiyan statues in Afghanistan. So not only did the Sikhs have a presentation called "Preservation of Sikh Heritage", but many other religions did the same and hopefully, the United Nations will go on to create a body to specifically safeguard historical religious sites around the world, especially in areas of conflict. Whilst it was inspiring to listen to stalwarts like Dr Balwant Singh Hansra, Dr Devinder Singh Chahal, Dr Harbans Lal, Dr Ranbir Singh Sandhu, Giani Gurbax Singh Gulshan, Kuldeep Singh (Sikh Youth America), Dr Avtar Singh Dhillon, Dr Pal Singh Ahluwalia, Jessi Kaur, Rajinder Kaur Nijjar and others, who provided a Sikh perspective at various fora, it was really heartening to hear the strong voices of modern Sikh youth too - film maker Valarie Kaur, whose film was screened at the PoWR, the Chardi Kala jatha from Miri Piri Academy of Amritsar, young volunteers from Guru Nanak Nishkam Sevak Jatha and local youth like Jagdeep Singh Shergill (Melbourne) and Youth Gurmat Sangeet Jatha (Sydney). The stories they shared, the traditions they displayed and the future they espoused filled every heart with a warm certainty - that our future is indeed, in very well nurtured minds, hearts and hands. Another highlight was the invitation to the Sikh community to bless the audience at the grand closing ceremony, and the Sikh representative was among the first two on stage - second only to the Christian representative. Although the Jathedar from The Akal Takht, Giani Gurbachan Singh, was meant to come to Melbourne, but because of tensions in Ludhiana with the dera crowd, he decided to cancel "at the eleventh" hour, as explained by his representative S. Roop Singh, an Additional Secretary of the S.G.P.C., who read out Jathedar Sahib's speech on stage. He spoke in Punjabi, with an English translation provided on the background screen. Renowned Sikh musician Dya Singh also participated at the grand finale, adding the final touch to kirtan by renowned jathas like Bhai Kultar Singh, Bhai Mohinder Singh and Bibi Gurkiran Kaur Khalsa, who performed during the course of the Parliament. A group of 11 young Sikhs aged between 14 to 25 years especially travelled from Sydney to Melbourne, to present a Gurmat sangeet recital at a session titled "An Exploration of Gurmat Sangeet - Sikh Musical Heritage." So all in all, Sikhs were very visible, both as participants and as members of the audience, throughout the PoWR. Everyone agreed, even those who had been to previous PoWRs at Barcelona and Cape Town, that Melbourne had the largest participation by the Sikh community. But many delegates felt that despite the numbers, something was missing - the ‘langar'! During the previous PoWR in Barcelona, Spain, volunteers from the Guru Nanak Nishkam Sevak Jatha had provided ‘langar' three times a day for the whole week, which became the highlight for each delegate. As the Executive Director of the Parliament of the World's Religions, Rev Dirk Ficca told me: "The celebration of langar was the spiritual heartbeat of Barcelona. It's a pity that logistical constraints didn't allow for the experience to be repeated in Melbourne". Apparently the health and food safety regulations in the state of Victoria (of which Melbourne is the capital), prevented the preparation and distribution of langar in the open. Personally for me, the week was a rich and rewarding experience. I met some amazing personalities from around the globe and had a chance to commune with the best thinkers, spiritualists and religious leaders of the current time. But many times one felt that with such a grand feast being offered, one could only peck at a few select dishes - and not enjoy the full meal . Very often, one could only skim through certain discussions, only to rush to another and catch it halfway. But such is the nature of organizing something of this magnitude; inevitably, the most interesting discussions would be held simultaneously in different rooms. Another thing that bothered me was - what next? There has been great discussion, an amazing confluence of thought and great suggestions offered, but where does this lead to? How much influence do religious and spiritual leaders have over politicians, who make the ultimate decisions that affect our lives en masse? Many spiritual leaders and delegates answered my question in different ways, but perhaps what Dirk Fecca said was most revealing - there was a ‘listening team' from the Obama administration present at the Melbourne PoWR, who made it their business to listen, engage and confer with various religious communities. That, I thought was very positive! What struck me though, was the huge number of ‘people of science', who spoke at this ostensibly religious gathering. A large percentage of the speakers held degrees (some with multiple degrees) in Physics, Chemistry, Engineering, Plastic surgery, Medicine and suchlike, blurring the apparent chasm between science and religion. On reflection, the Melbourne PoWR was a wonderful experience - it piqued the mind, challenged some stereotypes, brought many laughs and was a great learning experience. Although the cost was prohibitive and not too many locals could attend, but it was definitely a feel-good thought fest, best described as the Olympics of the religions. A recurrent reminder was to remember that religion is a path, not a destination. As the Swiss delegate, Prof Hans Kung put it, "Religion is merely a pointer to the moon; let's not get confused and think it's the moon itself." The Dalai Lama, in his closing speech, also made the point that all religious doctrines are remarkably similar. Their philosophies may be different but the core values are the same. He joked: "My Christian friends tell me I'm a good Christian. I tell them, they are good Buddhists." Perhaps that was the purpose of this exercise - to focus on the similarities, to understand each other better instead of creating water tight compartments in the name of religion; to learn, share and seek the highest truth - much like Guru Nanak showed us 500 years ago. I asked dozens of delegates about what the defining feature of the Melbourne PoWR was. Some said it was the inclusion of topics like climate change, others mentioned the diversity of cultures and thoughts presented and others still will remember if for Melbourne's hospitality. Personally for me, among the many stand out memories I'll cherish from this grand event, was a comment made by the founder of the Art of Living Foundation, Sri Sri Ravishankar: "Pain is inevitable but suffering is optional." Perhaps it's all about attitude. On the top, and thumbnail - Bhai Kultar Singh Raagi and Jatha. 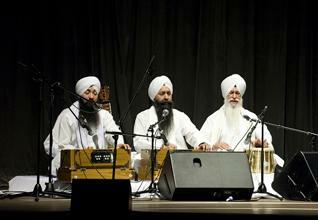 First and second from bottom: The Sydney Sikh Youth Kirtani Jatha comprising 11 Sikh youth in the age group of 14 to 22 years, lead by instrument players Jasmeen Kaur (violin), Manbir Singh (taus), Anantdeep Kaur (violin), Kamaldeep Kaur (harmonium), Ranbir Singh (tabla) and Inderpreet Singh (sur mandal); also, the sweet voices of Roopam Kaur, Gursargar Singh, Taranjit Singh, Dibjot Singh and Karanbir Kaur. Bibi Harsimran Kaur provided running commentary in English and Bhai Gurdev Singh provided music direction and other support.During their 45 minutes performance, they sang 5 shabads in Nirdharit raags under the title of "An Exploration of Gurmat Sangeet - Sikh Musical Heritage". The first is a performance at the Blackburn Gurdwara. The second at the Parliament. 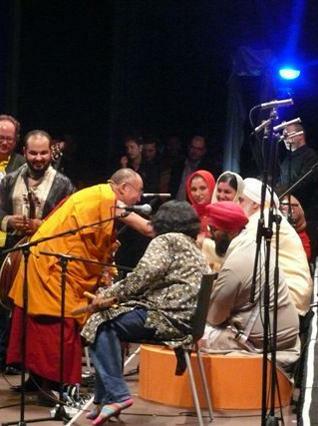 Third from bottom: The Dalai Lama greets Dya Singh and says: "Thank you for reminding me of Amritsar with your kirtan!" 1: Harjinder Singh (Barnala, Punjab), December 12, 2009, 6:19 PM. Thank you, Waheguru, that the Dalai Lama has remembred Amritsar! When he fled Tibet, he and his followers were provided with food and shelter at The Darbar Sahib, before they were given a permanent home in Dharmsala, which was then in Punjab. How unfortunate that he decided to keep mum on the tragedy of the storming of the Akal Takht by the Indian Army, while even the Pope in Rome condemned this ill-conceived and ill-fated operation and the massacre of thousands of innocent Sikh pilgrims. Are these so called religious people mere opportunists? 2: Harbans Lal (Arlington, Texas, U.S.A.), December 12, 2009, 11:12 PM. I agree with Manpreet that the Parliament at Melbourne was very successful and Sikh representation was greater than at Barcelona and Cape Town. Manpreet was one of the several journalists and media persons who worked hard to spread the word. Manpreet was present in many sessions that I attended and worked very hard to cover as much as she could. My regret is that I was put in a position where, to attend one session or speak in the session where I was committed to speak, I had to forgo another important session. Up to three Sikh sessions or speakers were scheduled at the same time. I could not attend or participate in all sessions where Sikh participants were scheduled. In spite of all this, I was pleased by the Parliament programs and by the hospitality provided by the local Sikh congregation in Melbourne. Many of us traveled to Sydney and other places after or before the Parliament. There too we were received with love and honour. I spoke in Sydney at two different gurdwaras where halls were full and I was honoured with a siropa. I also spoke at a reception-talk organized by Global Organization of People of India Origin. Similarly, all other speakers and visitors were received with typical Sikh love and reception. 3: Gurjender Singh (Maryland, U.S.A.), December 13, 2009, 7:59 AM. It was nice to read the article about the Parliament of the World's Religions. But I am surprised that, until now, I never read in any news about the event. There may be thousands of others who do not know about this. What is their next plan or place? Where can one find more details about this? 4: Gurmukh Singh (London, U.K.), December 13, 2009, 7:12 PM. A well balanced first report in journalistic mode by Manpreet ji. I have also been getting some feedback from Dya Singh of Australia and others. We need further debriefing from the Sikh perspective regarding organizational and thematic aspects for future reference. As someone has noted above, there has not been much news coverage of this event at a time when multifaith guidance is being sought by many western governments. 5: Manpreet Kaur Singh (Melbourne, Australia), December 14, 2009, 5:01 PM. In response to Gurjender ji's query and by way of background - the first Parliament of the World's Religions was convened in Chicago in 1893, with Swami Vivekananda as the main driving force behind it. It lapsed for nearly a century thereafter and a committee was established (Council for a Parliament of the World's Religions - CPWR)to celebrate the centennial PoWR in 1993 in Chicago. This was followed by two celebrations in Cape Town and Barcelona before Melbourne 2009. Venues are chosen through a bidding process, much like the Olympics. Rev. Dirk Ficca told me that 12 cities are bidding to host the next PoWR and the decision will be taken late next year - early 2011. 6: Sukhvinder Singh (Walsall, United Kingdom), December 21, 2009, 8:48 AM. Well done to all those that attended. As a suggestion to Manpreet's comment on 'what next', it may be a good idea if a follow up international event could be held by Sikhs. I am sure, for example, the 'Nishkam Sevak Jatha', headed by Bhai Mohinder Singh, has the capacity to organize such an event. 7: Harbans Lal (Arlington, Texas, U.S.A.), January 07, 2010, 11:38 PM. Someone asked me about the Sikh organizations represented at the Parliament. I can recall coming across the following: (alphabetically) included: Academy of Guru Granth Studies, Akal Takhat and SGPC, Blackburn Gurdwara Sahib, Chardi Kalaa Jatha, Chicago Sikh Society, Craigeburne Gurdwara Sahib, Gobind Sadan, Gurmat Sangeet Jatha, Gurmat Sikh Center, Guru Nanak Nishkam Sevak Jatha, Institute of Understanding Sikhism, International Institute of Gurmat Studies, Miri Piri Academy, Sikh Dharma International, Sikh Interfaith Council of Victoria, Sikh Welfare Council, Sikh Youth of America, Sri Guru Nanak Satsang Sabha, United Sikhs, World Sikh Council. 8: Tajinder Pal Singh (New Delhi, India), January 15, 2010, 5:44 AM. Comment on "Parliament of The World's Religions: Melbourne, Australia"